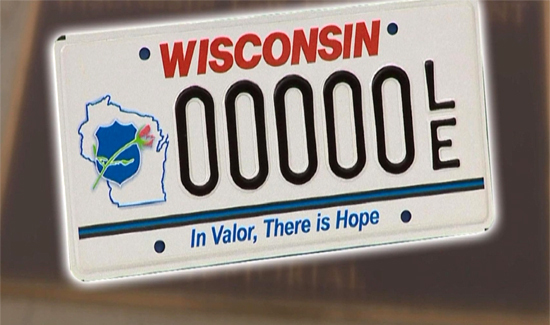 In Wisconsin, there are now special commemorative license plates that honor fallen law enforcement officers. From Wisconsin DOT: Any Wisconsin resident may apply for Law Enforcement Memorial license plates. The plates recognize Wisconsin law enforcement officers killed in the line of duty. For more information, visit Wisconsin Law Enforcement Memorial​ and the National Law Enforcement Officers Memorial Fund. * A $15 issuance fee when non-personalized plates are issued or reissued. This is a standard fee for all special license plate types. If you would like personalized plates, the $15 fee is required each year. * The regular registration fee for your vehicle, if your current plates expire within three months. At each plate renewal, you will pay the regular registration fee for non-personalized Law Enforcement Memorial plates.